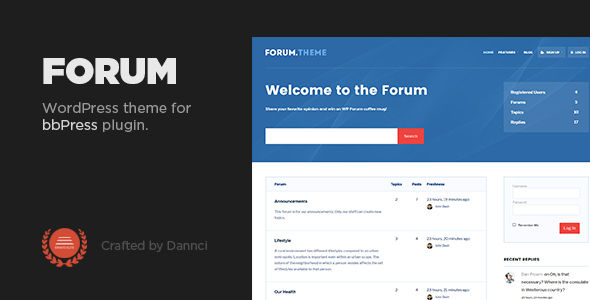 Forum â€“ A premium easy-to-use WordPress theme for free bbPress plugin. It comes with clean, fresh and modern functional design, is an ideal choice for your forum or bulletin board website. Forum layout and light color scheme is optimized for great readability. Keeps things as small and light as possible while still allows great add-on features through WordPressâ€™s extensive plugin system. What does all that mean? bbPress is lean, mean, and ready to take on any job you throw at it.